It’s a bird, it’s a plane…no wait, it’s a bird of prey protecting a plane! Just when you thought it couldn’t get any better than a herd of ruminants clearing brush at airports, now our furred and feathered friends are keeping the air safe. 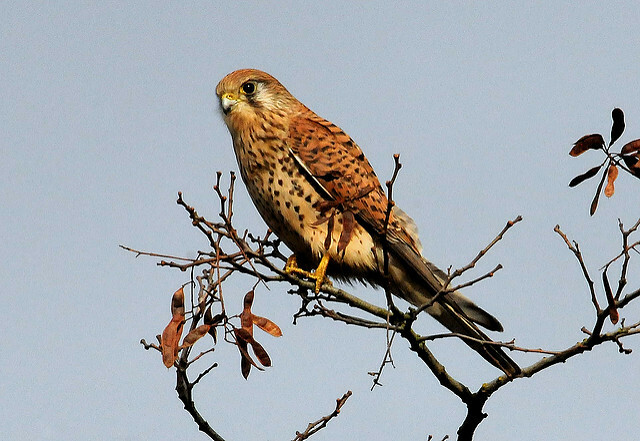 That’s right – birds of prey are now used to keep airports free of loitering birds. It might seem unbelievable, but flighty birds can cause an uproar at airports. Birds can be sucked in to airplane engines causing millions of dollars of damages every year. And remember the hapless birds that strayed in to the flight path of US Airways Flight 1549 in 2009? They knocked out the engine of the plane causing it to make an emergency landing. Airports have to make plans to control the wildlife and mitigate environmental factors that affect safety. Many airports choose to use the big guns, such as explosives, but about 20 airports in North America show a little finesse in their strategy. Instead of blowing things up, some airports are choosing more natural methods for dealing with the bird problem. Some airports, like Toronto’s Pearson International and JFK airports, are setting birds of prey loose to patrol the runways. After about a month of training, the birds protect the air by intimidation alone (birds will scatter when they see these birds of prey flying) or by direct combat with invaders (they can knock the intruders down, or in some cases, make a quick meal out of them). And companies like Falcon Environmental Services specialize in providing birds of prey to airports and air force bases. The plane-protecting birds are birds of prey – impressive, intimidating birds that control the skis (and steal chickens) around my farm. Think hawk, falcon, kestrel and even bald eagle. They are nothing to be messed with, and the wild birds know. Photo courtesy of Kev Chapman.